Macadamia blondies are a rich, dense, white chocolate version of classical brownies, with macadamias for a nutty contrast. You should save this fuel for your longest rides (recommended Strava suffer score >250). Also, if you believe this study, cycling performance is improved specifically by eating dark—not white—chocolate, due to a cocoa component that improves blood vessel dilation. So, as a cyclist you should eat dark chocolate. Or you can drink beetroot juice for the same effect. Your call. Pre-heat oven to 160 °C (fan-forced). Fill a saucepan with 2-3 cm of water and put on medium heat. Place a glass bowl in the saucepan such that the glass is not in direct contact with the water. 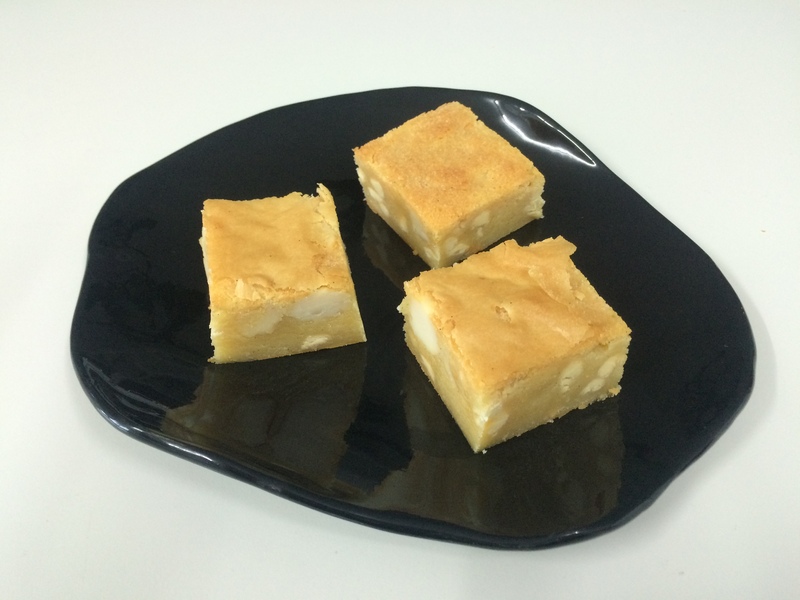 Chop butter into 2-3 cm cubes and break white chocolate into pieces. Place white chocolate pieces and butter cubes into glass bowl and allow to heat gently with stirring until just melted (*). When the butter-chocolate mixture has melted, allow it to cool slightly then add eggs beaten with vanilla bean paste. Whisk until smooth then add to flour, caster sugar, white chocolate chips, and macadamia nuts in a large bowl. Mix until only just combined then immediately spread the mixture in a greased, paper-lined tin (20 × 20 cm). Bake 40 min or until a skewer inserted in the centre comes out clean. Let cool in tin overnight before cutting. (*) If you over-heat the white chocolate and butter mixture, it may curdle and separate. If this happens, all is not lost—you can save the mixture by letting it cool slightly then beating the eggs in with a whisk until you have a smooth batter.